Place all of the ingredients in the water in a medium sized pot and bring to a boil. Reduce to a simmer and cook approximately 45 minutes. You may use more water if you prefer to have this to be a soupier consistency. Sprinkle with lime or lemon juice after you have removed it from the heat. 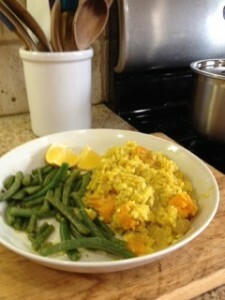 This Kitchari contains 5 of the Ayurvedic Six Tastes. When we add a green vegetable, we then have a delicious meal with all Six Tastes.